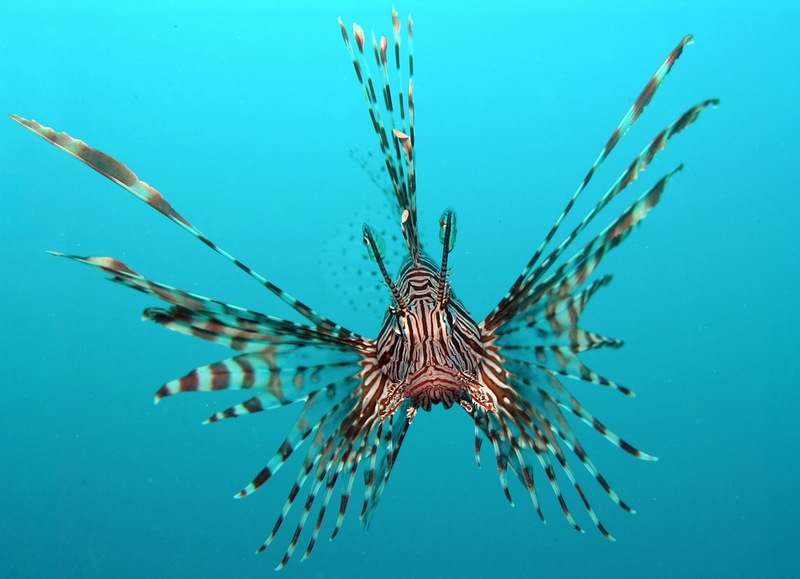 The introduced lionfish Pterois volitans . It is suspected to have been introduced by aquarium keepers and has become established in the Caribbean. Photo courtesy of wikimedia.org. This is the question I get asked all the time. The short answer is because I’m interested. I’ve always been interested in community ecology: the study of the organization and interactions within a group of organisms (predation, herbivory, symbiosis). Interactions within a biological community fluctuate around equilibrium until they are disturbed. People can disturb ecosystems through habitat destruction, pollution, and by introducing new species to the ecosystem. This upsets the fine balance that has evolved over millions of years in these ecosystems and can throw the system into a state of dysfunction. The balance can be so upset that species may go extinct opening up new niches (jobs) for more introduced species. You end up with a snowball effect and a habitat full of introduced species. About half of the organisms listed as threatened or endangered under the Endangered Species Act are impacted in some form by introduced species (Pimentel et al., 2005). Not good. The domestic cat costs the US approximately $17 billion dollars (Pimentel et al. , 2005) in control and damages. Domestic cats are estimated to kill 2.4 billion birds and 12.3 billion small mammals in the US alone! Photo courtesy of nytimes.com. Not only are introduced species bad for the ecosystem, they are bad for you. They cost the US more than $120 billion a year (Pimentel et al., 2005). This cost includes damage to infrastructure, crops, and property values. For example, property values of Vermont lakefront landowners was decreased 16% after Eurasian water milfoil (Microphyllum spicatum) clogged up their lakes (US Fish and Wildlife Service, 2012). Eurasian water milfoil clogging up a lake. Would you like seeing this at a lakefront property? Photo courtesy of forestryimages.org. Every year black and Norway rats (Rattus rattus and Rattus norvegicus) consume $19 billion worth of stored grain as well as destroying other property. US agriculture loses $13 billion annually in crops from introduced insects (US Fish and Wildlife Service, 2012). Some introduced species are hazardous to your health. For example the introduced Asian tiger mosquito (Aedes albopictus) is a known carrier of disease linked to over 20 diseases including yellow fever and chikungunya fever. The Asian tiger mosquito having a blood meal. These mosquitoes are known to carry at least 20 diseases. Photo courtesy of delaware.gov. The list goes on and on. There are many serious impacts associated with introduced species and special care should be taken to eliminate the introduction of more species to reduce future costs in management and damages. I think Benjamin Franklin said it best when he said: “[a]n ounce of prevention is worth a pound of cure”. Thanks for reading. If you like what you see or have any questions leave a comment below. Don’t forget to subscribe to our blog! Pimentel, D., Zuniga, R., and Morrison, D. 2005. Update on the environmental and economic costs associated with alien-invasive species in the United States. Ecological Economics 52: 273-288. US Fish and Wildlife Service. 2012. The cost of invasive species.